Government Secretary General Dragi Raskovski was left stumpted during the press conference today, when a journalist asked him if he understands a word of what Deputy Prime Minister Bujar Osmani is saying in Albanian. 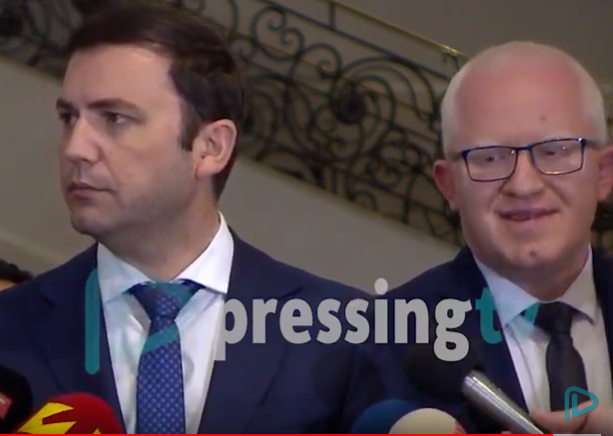 Raskovski and Osmani held a joint press conference to discuss the implementation of the law on the use of the Albanian language, which turned Macedonia into a fully bilingual state, contrary to the Constitution. Osmani, who is Albanian, took questions in Albanian, and as no translation was provided, most of the press and Raskovski were left scratching their heads. Mr. Raskovski, do you understand anything that is being said?, PressingTV journalist Hristo Ivanovski asked the Secretary. Raskovski gave only a bemused smile in response.